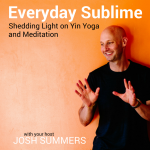 A series covering the foundational elements of Chinese Medical theory on Josh Summers' podcast, The Everyday Sublime: Shedding Light on Yin Yoga and Mediation. The second big function of the Blood in Chinese Medicine is that Blood is said to have the function of ‘moistening’ tissues. Strong Blood prevents things from drying out. Healthy Blood keeps the tissues moist, keeps the eyes from feeling dry, keeps the sinews (or tendons) lubricated, and moistens the skin, nails and hair, preventing all from becoming dry, cracked, and brittle. As with everything in Chinese Medicine, all entities – whether they be a type of energy, an organ, or a meridian – tend to be defined by the functions they perform. And the concept of Qi is no different. It’s classification as a type of energy is defined by what functions it performs, and for Qi there are Five Primary Functions. One way of thinking of the Meridians of Chinese Medicine is that they are, generally speaking, channels of communication within the organism along which subtle informational signals are transmitted. Qi is “perceived functionally, by what it does,” is critical to remember. Entities in Chinese Medicine are almost unanimously “perceived functionally,” that is, defined by what they do. We’ll see this affirmed again and again when we look at the meridian system. Meridians are defined by what they do, functionally – the organ system – organs are defined by what they do, functionally – and the Vital Substances of the body – which again are defined by what they do, functionally for the whole organism. By observing Yin and Yang dynamics both in the macrocosm and within the microcosm, the overarching intention was always one of promoting harmony. When honored, observed and respected, Yin and Yang describe processes of change that can be fluid, harmonious and balanced. Of course, if neglected or disregarded, the ceaseless process of change between Yin and Yang can break down and no longer be a smooth, harmonizing process of balance, but rather turn into a disruptive, chaotic, and jarring dynamic of imbalance. Taoists observed how the play of cycles in Nature would manifest in parallel within their internal experience. Understanding and attuning to the world outside facilitated an ability to bring the internal microcosm into harmony with its world, and vice versa, where greater understanding of the microcosm – especially through meditative insight – supported this harmonization with the external environment or macrocosm. A holistic approach to medicine will formulate a diagnosis of a patient’s condition by taking into consideration the complex dynamic of everything going on internally with that patient, as well as external influences of interpersonal relationship, work, and climate. Whereas a more conventional approach to medicine will try to identify a singular causative factor that generates illness and which needs to be eliminated or suppressed.